Are you late? Late for a very important date? Now you can become the white rabbit from Alice in Wonderland. We have a great selection of white rabbit costumes. The white rabbit is one of the first characters to appear in the Alice in Wonderland book. He is wearing a waistcoat and is muttering "Oh dear! Oh dear! I shall be too late!" This is where Alice follows him down the rabbit hole into Wonderland. 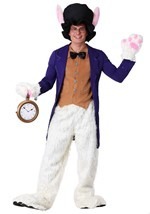 Become this great character from Wonderland in one of our White Rabbit costumes.